Ethyl ether, also known as diethyl ether, or often referred to as just “ether,” is used as a reaction or extraction solvent in the chemical, fragrance, and pharmaceutical industries. As an extraction medium, it is used to extract acetic acid and organic acids from aqueous systems in the cellulose acetate and plastics industry. In the automotive sector, it has various applications, such as use as an octane and oxygen enhancer in gasoline, and in diesel starting fluids, lubricating oils, and removal of paints and varnishes. When combined with ethanol, ethyl ether finds use as a solvent for cellulose nitrate in gunpowder manufacture and pyroxylin plastics. Ethyl ether also finds use in pharmaceuticals as a solvent for drugs, and also because of the toxicity of the vapors, can be used as an insecticide and fumigant. The United States is the largest producer and consumer of ethyl ether, the largest markets being engine starting fluids and use in laboratory and industrial reagents, which account for over 65% of total consumption. Use in smokeless gunpowder formulations contributes a further 26% of total consumption. The United States is the leading producer of ethyl ether in North and South America, accounting for about 90% of production in the region in 2017. Production of ethyl ether in Mexico, Argentina, and Brazil is minor, while Canada imports its ethyl ether from the United States. The main uses in the United States continue to be for engine starting fluids and smokeless gunpowder, which together account for about two-thirds of consumption. However, limited growth is expected in these areas. Relatively stronger growth will occur for laboratory and industrial reagent use, which currently accounts for 28% of domestic ethyl ether use. China is the leading producer of ethyl ether in Asia. The other main Asian producer is India. There is also minor production in Taiwan, Thailand, Singapore, Indonesia, South Korea, and Malaysia. Demand for ethyl ether in Asia is expected to increase at an average annual rate of 2%, driven mainly by the increase in demand in China and India. 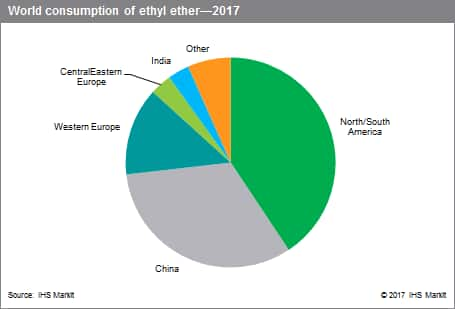 Western Europe is the main source of ethyl ether in the Europe, Middle East, and Africa (EMEA) region, accounting for more than 80% of the total EMEA production in 2017. Consumption of ethyl ether in Western Europe is expected to grow slowly during 2017–22, with demand being steady for chemical synthesis and military applications. Overall, global demand for ethyl ether is expected to increase by 1.5% annually for the next five years. Markets such as the United States and Western Europe are forecast to grow below global averages at 1% per year, while other markets such as the Middle East, Africa, and India will grow at faster rates (4–5%), albeit from much smaller baselines.